Our company wishes to offer a complete product to your logistic department giving you the best solution for the Motorsport events at Istanbul Park. Freight Forwarders, racing Teams, television and radio operators, suppliers, sponsor and petroleum companies (with regular ADR documentation). All supplier needing to move their trucks to Turkey to attend any Motorsport events at Istanbul Park. Our company has a 100 years experience in forwarding and a daily connection to the new Port Terminal in Pendik-Istanbul (please note the distance from Pendik port to Istanbul Park is 15 km). Our products includes the cost of customs operations. We guarantee your team reserved space and priority for loading. Our European Negtwork provide a complete service for all you needs. We continue assisting you also from our own office located indide the Istanbul Park. To enhance security, dedicated escorting service from Pendik Terminal port to Istanbul park. 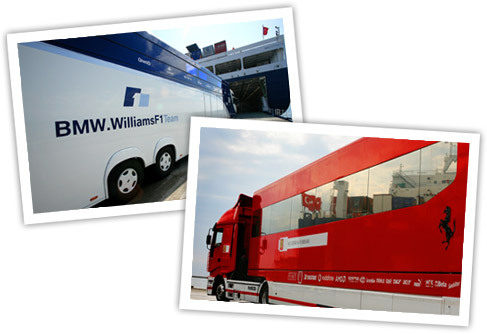 ...because Billitz has succesfully catered several motorsports events in 2005/2006.